Thomas Hughes knew that the Rugby Colony-now called Rugby Village-was special and he hoped that future generations would become actively involved in its continued growth and development. He fervently hoped others would reap the benefit of the seeds that he and other colonists had sown in the 1880’s. Little did he know that it would be a young man from a nearby community who happened on the remains of Rugby in the 1960’s who would lead the charge at recreating a vibrant community in Rugby once more. By that time, many buildings were in various stages of sad disrepair, several had burned or been razed after being abandoned. But Brian Stagg, the young man inspired enough to start an organization called the Rugby Restoration Association in 1966 along with other dedicated locals, sowed the seeds for the rebirth of Rugby. The few people left in the sleepy village from the turn of the century into the 1960’s were descendants from the original colonists and the Appalachian families that had already settled here, as well as members of families that moved into the area in the 1930’s and 1940’s. These folks cared deeply for Christ Church and the Hughes Library and had kept them open and active, showing them to visitors still interested in the Rugby story. We owe these dedicated families much gratitude for persevering during the hard times of the early to mid 1900’s and keeping Rugby’s story alive. They include members of the Walton, Kellogg, Brooks, Wichmann and the Oscar Martin and Irving Martin families as well as others. Brian Stagg worked with these and many others, to invigorate the Rugby Restoration Association during the 1960’s and 1970’s to protect Rugby. Two key things happened at this point. The Big South Fork National River and Recreation Area was developed and Rugby supporters worked with the U.S. Army Corps of Engineers on a Master Plan for developing Rugby as the southern gateway into the park. Historic Rugby’s Board has been guided by the suggestions in this award-winning Master Plan. In 1972 Brian Stagg was able to get the village of Rugby and many of its historic buildings placed on the National Register of Historic Places as the Rugby Colony Historic District. 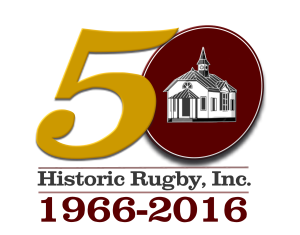 In 1978 his sister, Barbara Stagg, took over as Executive Director and in 1982 the organization changed its name to Historic Rugby. Over the next 32 years, Ms. Stagg was able to bring Historic Rugby to national attention. John Gilliat, her husband, served as Properties Manager in Rugby for much of that time. The two spearheaded bringing the housing development Beacon Hill to fruition, as well as the new Visitor Centre and Theatre built in 2005. Their work also culminated in the building of the Massengale Homeplace and Trail in the Rugby State Natural Area in 2010. Thanks to Ms. Stagg and her nephew, Michael Stagg, an environmental lawyer, many acres surrounding Rugby were protected for future generations. After Ms. Stagg retired, other Executive Directors worked hard to ensure that Historic Rugby and the Rugby community continued growing. The Board of Directors developed a strategic plan which helped them modernize and streamline the organization. Substantial restoration work to fix the deteriorating historic buildings was accomplished during this period thanks to generous donors who provided funds to the Historic Building Fund and to Steve Logan, who oversaw most of the restoration projects. Volunteers became pivotal to the success of the organization as they helped in all aspects of the organization including creating new interpretive programming and special events. The current Board of Directors is working hard towards making Historic Rugby a sustainable organization. Thomas Hughes’ vision for this tiny, beautiful spot on the Cumberland Plateau may not have played out exactly as he had planned, but his dream continues. Historic Rugby and the community of folks who live here are dedicated to preserving the village and interpreting its history for as many people as possible. We hope to sow the seeds of the dream in future generations! Hughes would be thrilled to see that after 135 years Rugby Village continues to grow!